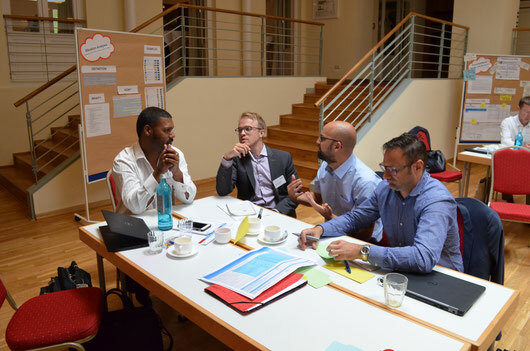 THE GFA CONFERENCE ON FISCAL AGENT SERVICES FOR THE GLOBAL FUND - gfa-groups Webseite! Whether related to loans or grants – public financial assistance has an essential role in development cooperation. Fiscal accountability and transparent procurement are vital pillars of an ever-growing stream of development funds channeled through public and/or private institutions to final beneficiaries. Donors providing funds are accountable to their constituencies, be it government bodies, taxpayers or other third parties. They rely on the implementation of effective fiscal and procurement management standards as well as reporting according to international norms. The role of GFA in financial fund management as well as in the procurement process is twofold. On the one hand, we ensure fiduciary oversight, effective procurement processes, as well as transparent reporting systems. On the other hand, we provide effective advice and develop capacities in accounting, budgeting, standard internal controls, standard procurement procedures and reporting requirements according to international standards. More than a decade ago, GFA won its first fiscal and procurement agent contract in Ghana financed by the Millenium Challenge Corporation. Ever since then, GFA has expanded its services in depth and has diversified its client base working in over 30 countries worldwide. The Global Fund has become one of our most important clients. Building on the experiences gained, we find it crucial to exchange ideas, discuss new concepts, and develop best practices. 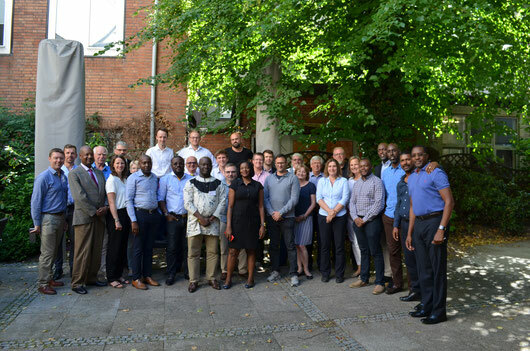 To this end, GFA invites GFA consultants working on behalf of The Global Fund, staff from GFA headquarters and representatives of our client to a bi-annual conference in Hamburg. 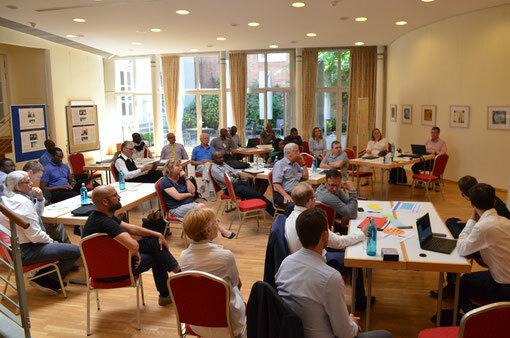 The Public Finance Management (PFM) Department of GFA organized a Conference on Fiscal Agent Services for The Global Fund at the Baseler Hof in Hamburg in June, 2018. The event was to exchange good practices of fiscal agent services for The Global Fund to Fight AIDS, Tuberculosis and Malaria. Within the PFM De­partment, the portfolios Finance, Accounting, Audit and Procurement implement fund management projects worldwide, including the ones of The Global Fund. The Global Fund is the major multi-donor financier of programs to fight AIDS, tuberculosis and malaria, and generally strengthens health service systems. Since its creation in 2002, approved funding of 33 billion US dollars was disbursed for around 1,000 programs in more than 150 countries. In September 2012 and again in August 2016, The Global Fund entrusted GFA Consulting Group with an indefinite quantity contract regarding financial advisory services. The assistance covers fiduciary, fiscal and procurement tasks, financial verification and oversight, internal audit services and the set-up of internal control systems, risk assessments and capacity building. GFA has 25 years of experience with fiscal and procurement management services for major funding agencies such as the Millennium Challenge Corporation, World Bank, KfW Development Bank or The Global Fund. This is complemented by innovative and client-oriented solutions based on cross-sectoral expertise incorporated in the company’s technical and regional departments. Moreover, GFA experts excel in the double role of aid management, providing advice and capacity building as well as overseeing and controlling third party funds. GFA’s financial management services for The Global Fund projects in ten countries are tailored specifically to the respective diseases, implementing countries, institutional capacity, and sector and project objectives. The services comprise financial oversight, capacity building in accounting, reporting, budgeting and standard internal control functions adapted to the needs of the funds’ principal and sub-recipients in a particular country. Fiscal agent services are required to assist the principal or sub-recipients in capacity building related to financial and procurement management functions. GFA teams mitigate the risk of fraud or misuse of grant funds, minimize complaints, and increase the efficiency of fund management in compliance with The Global Fund standards. Fiscal agent services take care of all financial transactions on behalf of the implementing entity, e.g. payment compliance with agreed procedures or safeguarding and implementing control mechanisms together with the recipient. Given the specific risk context in which The Global Fund grants are implemented, further scrutiny of financial and accounting processes may be required. In addition, existing procedures and systems may need updating. Capacity building assistance and training on accounting and financial management is a key responsibility. Experts of GFA Consulting Group and GFA B.I.S. have developed, customized and implemented a comprehensive financial management system for these specific needs. GFA B.I.S. is a daugh-ter company of GFA specialized in customizing professional standard software to clients’ needs. In addition, GFA B.I.S. has extensive experience in IT consulting focused on the optimization of existing software systems. The systems offered to The Global Fund are based either on Infor FMS SunSystems for those projects that have to provide audited reports, or on Excel where a pure declaration of data integrity of partners’ accounting system is required and has been field-tested in several fiscal agent projects. In some of its projects, GFA is expanding the financial services to procurement management and supply change management reflecting the growing trend to combine financial, procurement, and supply chain management. 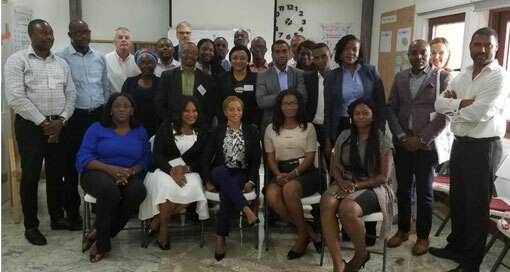 The GFA Conference on Fiscal Agent Services for The Global Fund aimed at bringing together all implementing actors of GFA fiscal agent activities for The Global Fund, particularly GFA country team leaders and headquarter experts as well as the Fund’s country team representatives. The first two days of the conference focused on the presentation of new concepts and tools developed by GFA addressing typical daily duty aspects of a fiscal agent. The Standard Procedures Manual as well as the Oversight Protocol attached to it were the backbone of the related technical sessions. 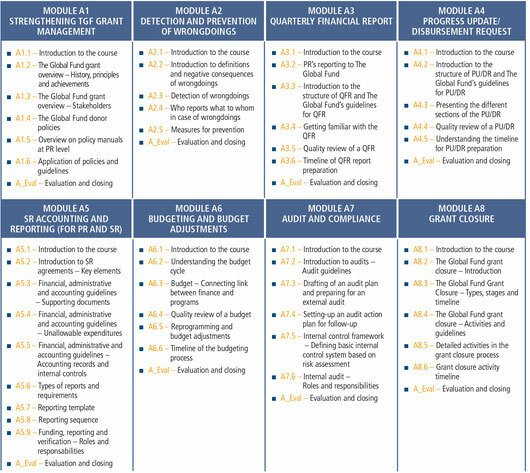 The objective of the manual is to provide a comprehensive description of standardized procedures, structures, and roles of fiscal agent activities. The manual serves as a guideline for setting up and running a fiscal agent project in order to ensure that the project meets the minimum standards of excellence and internal control. Attached to the manual, the oversight protocol has recently been presented to all project implementers as a standard procedure for internal control and quality assurance. Some topics with a wider spectrum of coverage were presented as conference sessions on how to detect fraud and on how to manage conflict among clients, project teams and headquarters. 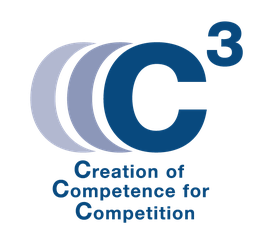 In addition, GFA presented its concept for capacity building by means of C3 training modules specifically designed to the needs of fiscal agent services. Another aspect GFA wanted to draw attention to was understanding problems from another person’s perspective putting oneself in the shoes of one of the implementing bodies. A role-play was organized in which participants had to play specific roles in a dedicated scenario. In order to add real-life flavor, this session was organized in the Bridge Bar located at the level of the Elbphilharmonie Plaza. The third day focused on the exchange of good practices among implementing bodies. GFA also presented GFA headquarter and the PFM department offices. Part of the sessions were held in GFA offices followed by a get-together in offices of the PFM department from where projects are managed. Team leaders from each project brought typical drinks and food from their country, and on the German side assistants organized food and drink specialties from Hamburg, pleasing each other in the sense of “You never get a second chance to make a first impression”. More than 40 participants from a variety of countries participated in the conference, including particular sector representatives like fraud, public health and IT experts. As this conference is considered a success, a follow-up event is considered in two years time. The training plan on page 4 provides more information. Financial management oversight by reviewing processes, procedures and policies for financial management and making recommendations for improvement and alignment with donor policies. Strengthening the internal control system by advising on the elaboration of key documents. Ensuring compliance as a co-signatory authority over payments vouchers and compliance of payment procedures and for procurement transactions. Increasing disbursement volumes by strengthening the beneficiaries’ budgeting and forecasting process, necessary reprogramming and consolidated disbursement forecasts. Ensuring data integrity of the automated accounting and reporting system. Auditing support to beneficiaries in audit planning, responses to audit findings and the development of actions plans. Reporting support to beneficiaries ensuring the accurate and timely preparation and submission of all financial information and reports to donors. Capacity building by assessing and diagnosing the financial management capacity of beneficiaries and developing appropriate capacity development plans, supporting change plans, and the design and documentation of processes through formal training, mentoring, and coaching. Fraud management by supporting and training beneficiaries in the design of adequate fraud detection, prevention, response procedures and tools. Procurement services by assessing procurement controls and identifying weaknesses, overseeing ongoing transactions, and acting as observer in tender evaluation committees.